Count ’em. Twenty-one participants… no, wait, 21 and a half (we’ll get to that later). 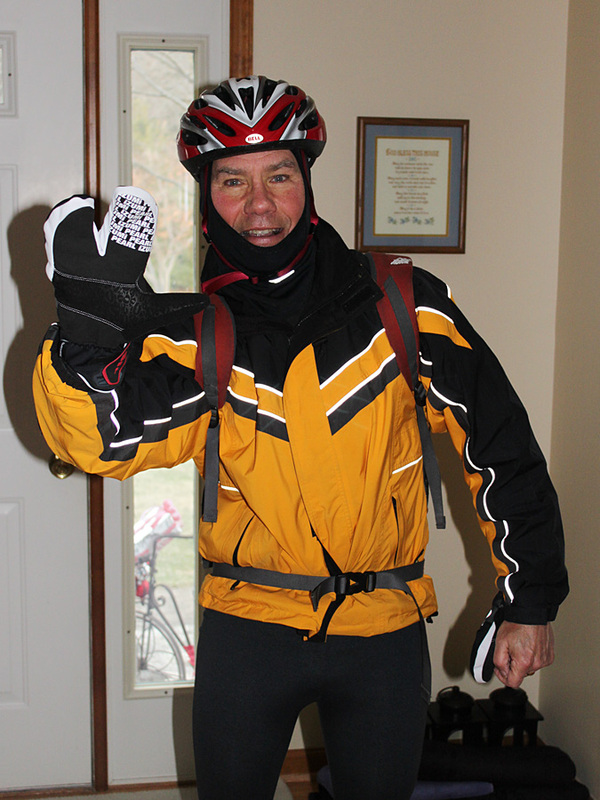 Bob Opila biked from Corner Ketch to West Branch prior to the run. 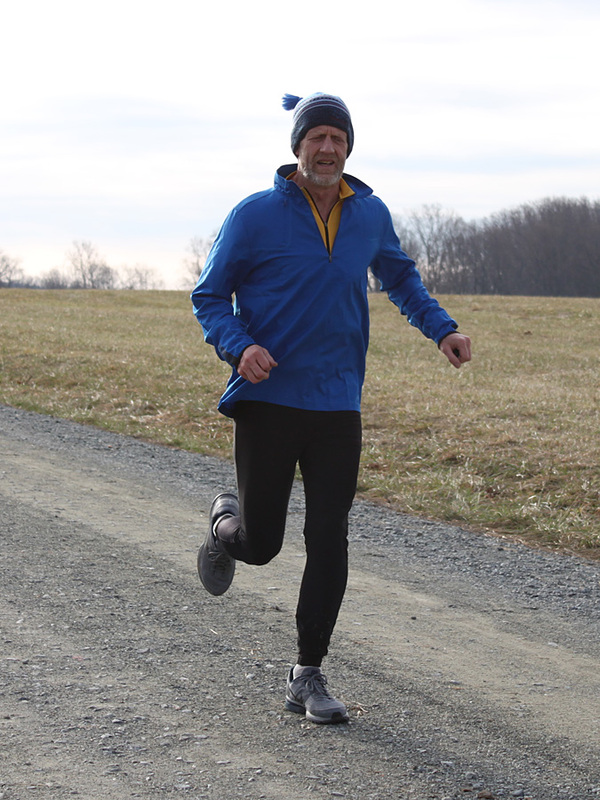 The morning started early, with nine runners showing up to carpool to Fair Hill, one of whom (CRR Bob Opila) was dressed for more than just running. 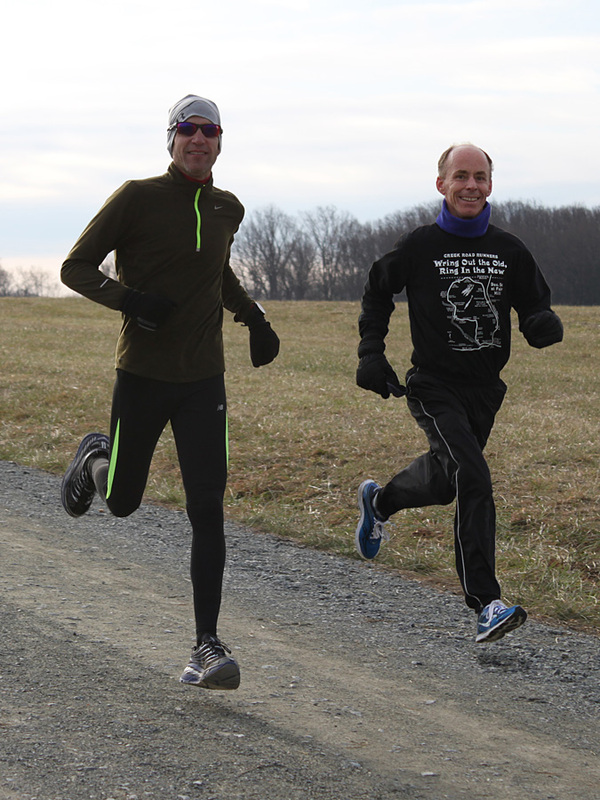 Twelve others met us at Fair Hill, nearly doubling the previous attendance mark (see 2010). Jay Coughenour and Bill Rose, the fastest of the fast, cruise. A group of three runners—CRR Bill Rose, CRR Jay Coughenour, and CRR Cole Galloway—dashed off at the start, quickly distancing themselves from all but one other runner. CRR Steve Tague caught up with the leaders about a mile into the run, and the four quickly disappeared as they turned to go past Oprah’s. The next group comprised CRR Mark Deshon, CRR Charlie Riordan, CRR Mike Shay, CRR Dave Schultz, CRR Vic Kaliakin, and CRR Steve Goodwin. 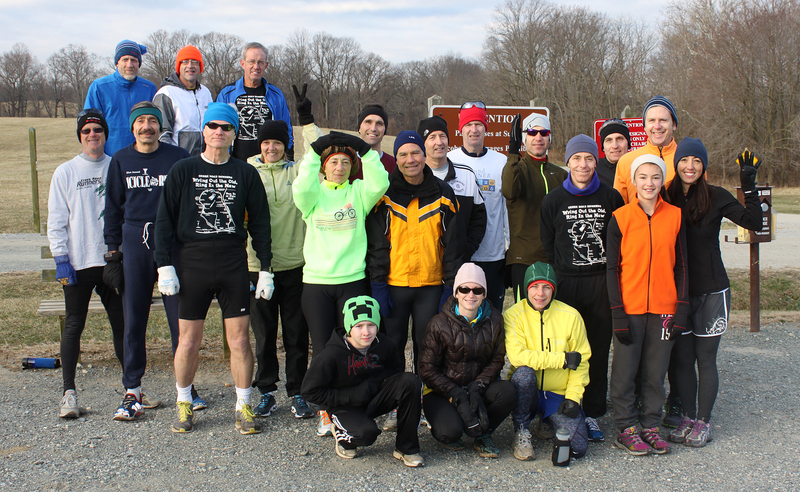 This group stayed together until the uphills began at about the two-mile point (the turn at the covered bridge). Trail specialist Cole Galloway finishes 4th. Thespian Steve Tague finishes next. The remainder of the runners were pretty much on their own, many of them pairing up for at least part of the run. There were some wrong turns made, probably due to the distance spread and the large number of runners who were new to the course. CRR Bruce Hubbard, a veteran of this run, even admitted getting off course himself (at one point, he remembered that there were no switchback trails on this route) and then helping others to get back on track. 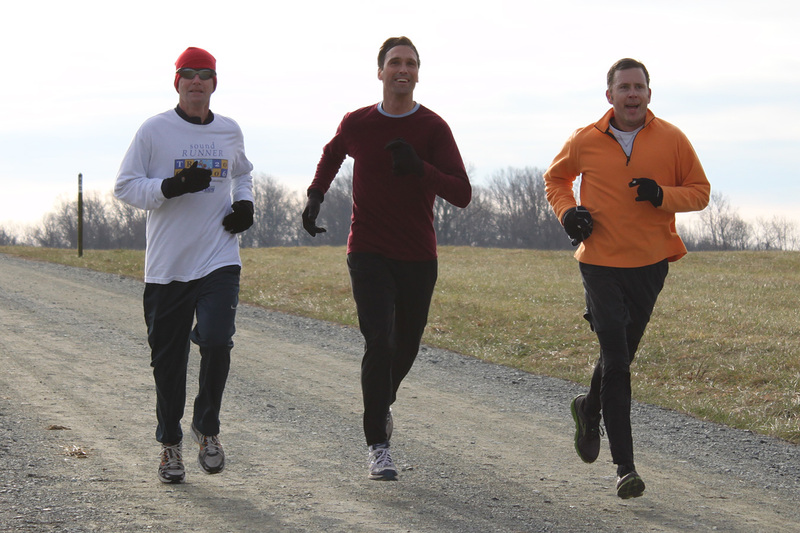 A triumvirate from the second group, Charlie Riordan, Mike Shay, and Dave Schultz, finishes together. The mushers with wheeled sled and dog team made an appearance, though only to the lead four. 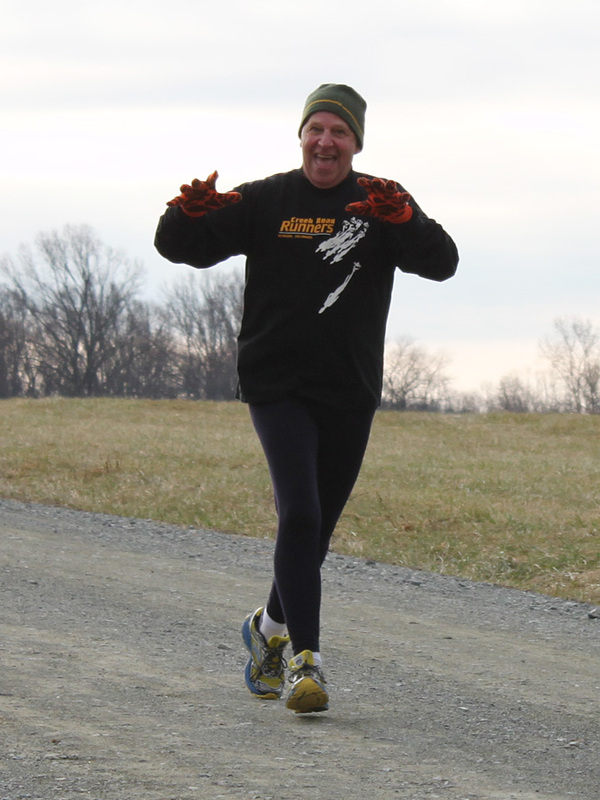 Deshon made a move at the covered bridge and upped his pace heading into the later half of the race. There were no takers among the second group, so he moved along solo. Goodwin and Kaliakin drifted back, as they expected they would, leading up to the big hill. Opila, who had biked to the carpool point earlier in the morning, followed behind them. Lovebirds Sue and Dan Simmons made it a together-time run. Having some fun, Lawson Schultz sprints past Vince McIntosh at the end. It can be scary when someone shows up late. Right, George Parsons? Everyone finally finished. CRR Dan Simmons and wife, Sue, did half the course together and appeared running in the opposite direction on the home stretch of the trail, presumably to get in some additional mileage. Speaking of opposite direction, every few years someone shows up late for one reason or another. This year, CRR George Parsons (he’s the “half” referred to earlier) had gone to the wrong parking lot (that’ll put ya behind at the start) and later in the run was seen running south in the northbound lane with Bill Rose, who had just finished. Parsons will be provided with a GPS device next year (just kidding). Anyway, he gets bonus points for having worn the classic black-and-gold CRR jersey and putting in a workout after all had left. 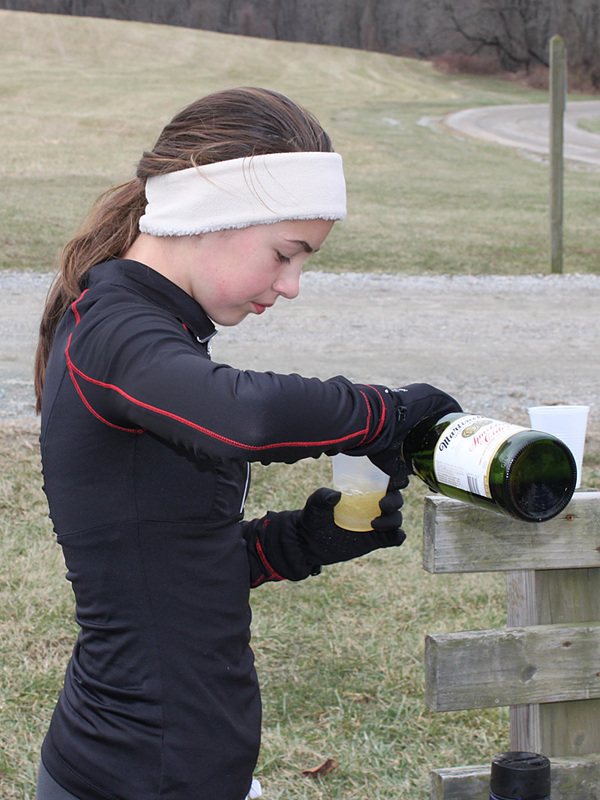 Lawson pours some of the sparkling cider. “Say, what’s in those bottles?” the park ranger inquires. Youth was served this year, in a great way. CRR Dave Schultz and CRR Christine Schultz brought their 12-year-old daughter Lawson, and newcomer Kelly Tyrell brought her 12-year-old son Logan. 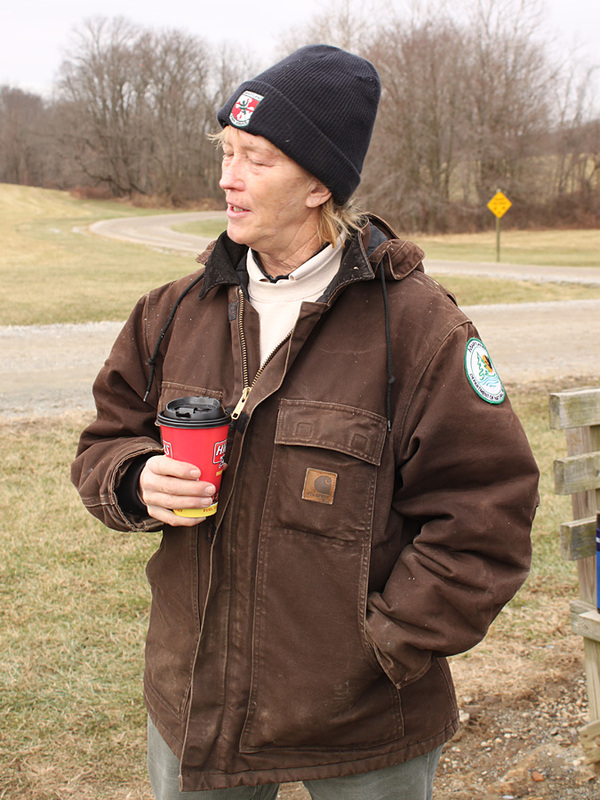 Newbie Lisa Lofland was happy there were at least a few distaff runners, having read about the run on this website. 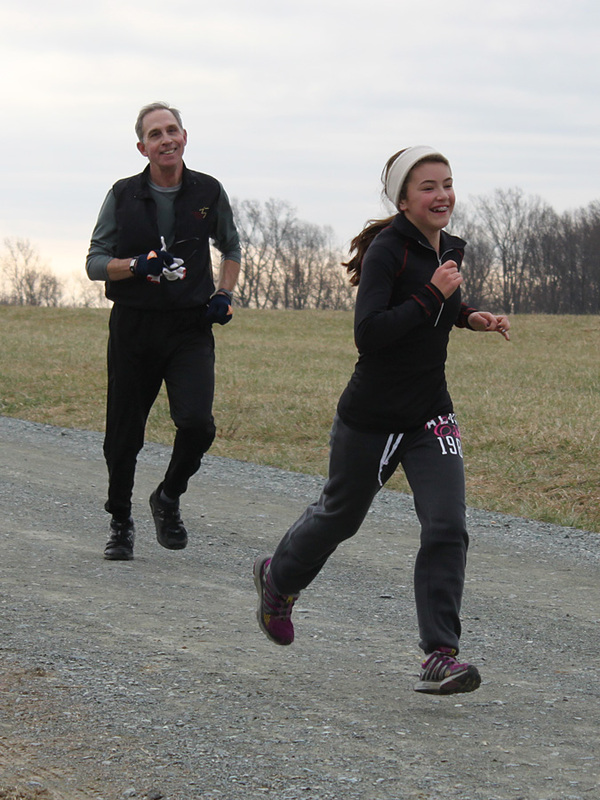 Danielle Vennard likes trail running and enjoyed running this course for the first time, having made some new friends along the way. 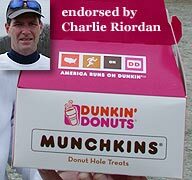 The proverbial “pot of gold” was there at the finish—the box of Munchkins™—thanks to Charlie Riordan (“Charlie runs on Dunkin’”), along with several bottles of sparkling juice to help celebrate the end of 2013. Even a park ranger got in on the fun; having done her duty by checking to make sure we weren’t bringing alcohol into the park, she enjoyed some of the treats provided. Thanks, Bruce Hubbard, for bringing the additional sugary fried edibles. Thanks to Vince McIntosh and Vic Kaliakin for bringing extra bubbly. 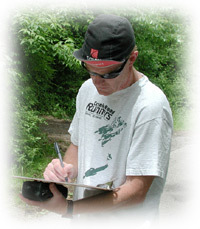 Dave Schultz was the lucky recipient of the course shirt in the newbie random T-shirt giveaway. Hopefully, this will be incentive enough for him and his family to return next Dec. 31. A good time was had by all. Mark Deshon presents the random shirt giveaway to “Wring Out the Old” newcomer Dave Schultz.